Saleyard buyer types – volume comparison. Home > Cattle > Saleyard buyer types – volume comparison. 13 Sep Saleyard buyer types – volume comparison. Current average monthly restocker purchases of EYCI cattle at the saleyard are at 5,500 head per week and is sitting 24% below the seasonal weekly average of 7,250 head. Current average monthly lot feeder purchases are at 5,700 head per week and is placed 18% below the seasonal weekly average of 7,000 head. Current average monthly processor purchase volumes are at 2,800 head per week and is 10% above the weekly average of 2,550 head recorded so far this season. Since the start of Winter there has been a changing dynamic at the saleyard for young cattle purchases. Declines in average volumes have been noted for restockers and lot feeders, on the back of reduced pasture availability and higher feed costs. However, processor purchases have bucked the trend as their margins are stubbornly clinging on to positive territory. 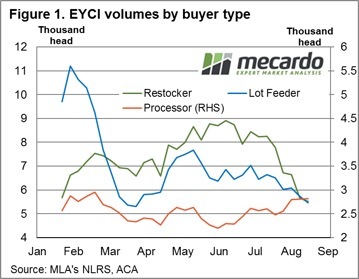 Analysis of saleyard average weekly volumes from the underlying EYCI data shows that over the last three months both restockers and feed lots have been reducing their buying activity, despite the price of young cattle declining 16% since the start of June. Figure 1 shows the weekly purchase volumes by buyer types averaged over each month since the start of the season. The recent decline in purchases of EYCI style cattle by restockers and lot feeders is clearly evident, with restocker volumes currently 24% below the seasonal average and lot feeders are 18% under. Interestingly, over the same time frame processors have increased their activity at the saleyard, such that current processor volumes are sitting 10% above the seasonal average. 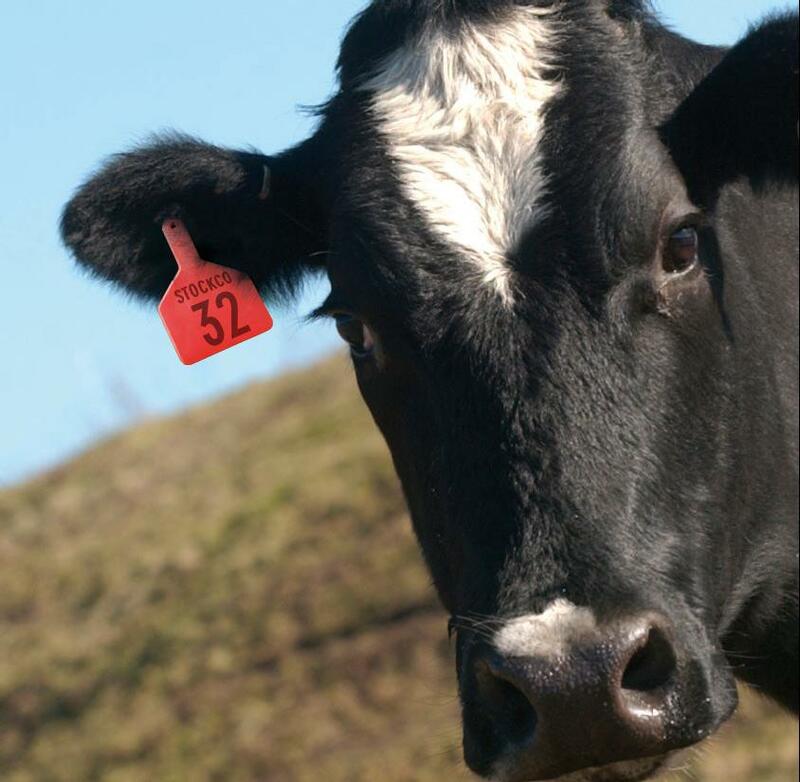 Over the season so far, restocker purchases have been averaging around 7,250 head of EYCI cattle per week. However, average purchases for the last month have reduced to 5,500 head as unseasonal dry conditions, highlighted by the rainfall deciles from June to August (figure 2), sap some of the optimism out of restocker demand. Similarly, feed lots had been averaging purchase volumes of around 7,000 head per week since the start of the season, but in the last month this has reduced to an average of 5,700 head. A spike in global grain prices saw feeder margins squeezed in early Winter. This was followed by higher basis levels for grain, particularly in the Northern NSW and Southern Queensland regions, as the persistent dry and frost events begin to impact upon expected yields in these areas. Read more about current feeder margins here. An updated Mecardo processor margin model (figure 3) shows August remains in the black, with an average per head profit of $17.50 recorded for the month. 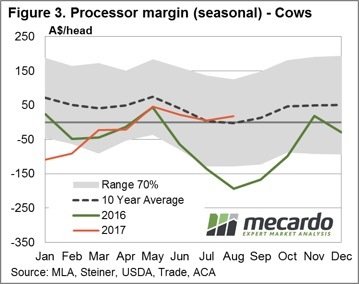 Indeed, the processor margin has been positive since May and this probably accounts for why the current processor purchase activity of around 2,800 head per week is sitting above the average recorded since the 2,550 head at the start of the season. The updated Bureau of Meteorology three-month weather outlook indicates a move to a more neutral condition for much of the country. The BOM expect rainfall to be below average in southwest Australia, above average in parts of southeast Queensland, and has a 50/50 chance of being above or below average elsewhere. 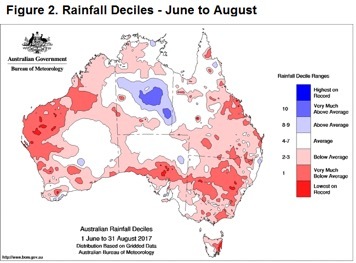 The prospect of higher than average rainfall to parts of southern Queensland and Northern NSW may see a revival in restocker activity here, providing some support to young cattle prices in these areas. Although, it may be too little too late to provide some relief for lot feeders in the form of a narrowing basis, particularly if forecast frosts into September continues to weigh on expected yields in these regions.